Ontario Native Americans are people identifying or identified as Native American sampled in the Canadian province of Ontario. 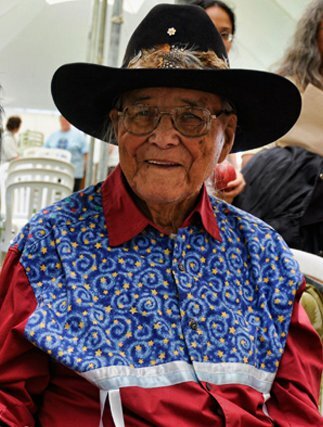 Chief William Commanda, who died in 2011 at the age of 97, was an Algonquin elder, spiritual leader and promoter of environmental stewardship. He also was the keeper of important historical wampum belts (tribal records). The Native American – Northern Ontario population data represent DNA samples from 63 Native American (Native Americans in Canada) individuals in the northern part of the Canadian province of Ontario. Samples were provided by the Royal Canadian Mounted Police. Photo: William Commanda, by Carol Noel, 4 August 2011.